When I was in grade nine, I auditioned for a school production of “The Wizard of Oz.” All the other girls wanted desperately to be Dorothy or Glinda but I wanted to be the Wicked Witch. I admired her fierceness. Unlike the other female characters who might be more sweet natured, the witch took matters into her own hands. Sure, she was angry, but that made sense to me. After all, Dorothy’s house had just landed on her sister. Why should she just forgive and forget? I got the part, but this may very well be because I was the only one who wanted it. The week the show ran I was in heaven, it didn’t even matter to me that the cool girls in the cast wouldn’t speak to me. Every time I stood on that stage wearing my drama teacher’s black evening gown and the pointy witch’s hat that my dad made, I knew I had authority. I stifled a laugh. Her shorts barely covered her bum. “It’s nice. It would look good on you.” She smiled, and continued searching through the dress rack. Occasionally asking my opinion on another outfit. I answered her questions, and smiled at her thinking she sounded lonely and stoned. Eventually I headed towards the book section and we drifted apart. The woman in front of me rushed up to the cashier, and I leaned against the counter willing myself not to cry. Over and over I kept thinking, that’s someone’s daughter. Someone’s daughter. I had a daughter. What if this was my girl? Where was her mother? Did she know where her child was? Did she care? At the same time I was angry with the young woman. Why the Hell was she killing herself when she was lucky enough to be alive. But I knew it wasn’t right to feel like that. Somewhere along the way she’d been damaged. After all nobody would choose to live that way. I was also angry with myself. While we’d been talking I’d wanted say, you need help, it doesn’t have to be like this. But I hadn’t. I was too scared of being ripped off. As if it really mattered, I only had twenty dollars in cash and all my cards could’ve been cancelled. Finally I made it to the cash. I was crying. The cashier gave me a sympathetic glance. “Life is hard,” she answered with a heavy Russian accent. Mark and I have now been home a month from our trip across the States and Japan. I’ve had a difficult time adapting. On the road, if someone asked me if I had children I could choose to lie or answer simply, yes. It gave me a sense of control over my life. Back home, I can’t do that . Not long ago I had to tell three people in one day India died. Each time I said it was like being punched in the stomach. Then as if that isn’t enough, I ended up comforting them as if it’s my fault. This isn’t supposed to be my role but I can’t just stand there and watch people cry. Since I’ve returned home I’ve begun to notice that I’m changing. I don’t have the patience I once had and find myself blurting out feelings that I’d once have censored. At first I tried to stop it, push it down. I was afraid I was becoming mean, but I understand now I merely don’t have the energy to contend with certain levels of superficiality. Grief seems to amplify the everyday cruelties the same way taking a finicky friend camping suddenly makes all their fussy quirks seem annoying. It’s as if I’m an apple and I’ve been peeled all the way down to my core. The only time I ever questioned my choice to play the Wicked Witch of the West was after a matinee performance at a local grade school when the kids gathered about the other leads, but avoided me. I even remember telling them, “I’m not really a witch, it’s just a costume,” but none of them would chance it. The last nine months have taught me a great deal about risk, those I’m willing to take and those who are willing to take them with me. 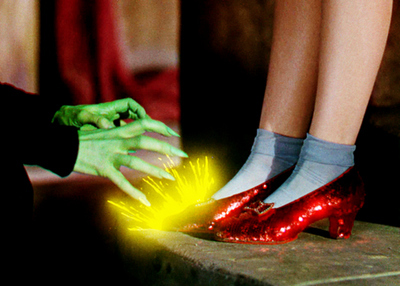 Like the wicked witch, I may live on the outskirts, and may even be feared by society, but there’s opportunity in that. A chance to finally get those red slippers. (I want to say, wonderful writing, but it seems cheap). I don’t know if it will help. I think it helped a friend of mine, once. I do send you love and warmest wishes. Oh I must read that book. I love that quote. Thank you for sharing it and taking the time to read my blog. Thank you for your painful honesty. I know you are helping others who cannot expose their own losses as you do. I sure hope it helps others. That would mean a great deal to me. dear Lesley, I continue to be drawn to your honesty, to say nothing of your beautiful articulation of your grief. I believe that I am one of those ‘People willing to understand how it feels to grieve’, and I value your contribution to this death-averse culture. Please know that you are in my thoughts and that you offer a great gift. Yes, I know Refuge in Grief. It’s one of the best. Thank you for following my blog, Janice. I appreciate it. I read your blog, have done for a long time and I am always blow away by the power of your writing and the truth you put into it. I’ve had my Mum read it recently as well – we lost both her parents in rapid succession last year and she struggled with guilt over how she felt about their losses almost as much as their loss. Thank you for facing into death head on and lighting a path for us. Thank you. I hope the blog helped your Mum. It helps me to write about this subject though it’s never easy. —Gorgeous, beautiful story. I savored every word. Why can’t we have the witch hat and the ruby slippers?! For me, I wanted to be Glinda. Thank you for reading. Yes, it would be nice to have it all. I wish we could. Yes, losing the people we love changes how we feel about everything. xox I spend a lot of the time asking for her just to come back. I don’t know who I’m asking, really. But they aren’t listening.